Did you know about the Google trick where you can get the definition of any word by searching for “define <word>”? It’s a neat trick, and the result that Google gives you includes their ultra cool “use over time” feature, sometimes. But if you’re like me, you may have a favorite dictionary. (Mine is Merriam-Webster.) Wouldn’t it be a great writing tool if you could somehow program a web browser like Google Chrome so that when you search for “define <word>” you get the result from your favorite dictionary? First, go to your favorite dictionary and search for a word. When the results page comes up, pay particular attention to the URL — the website address. You will need this soon. Scroll all the way to the bottom of this window and you’ll see three text boxes. In these three boxes, enter a name for the search engine (anything you want), the keyword you want to use (in this case: define), and finally the “URL with %s in place of query.” What’s that? That’s the website address I said to remember. Just replace whatever word you searched for with %s. Click Done and you’re done. Now go to the address bar of Chrome and type: define nincompoop, or whatever word you want to look up, and when you press Enter, your result will come not from Google, but from your favorite dictionary. 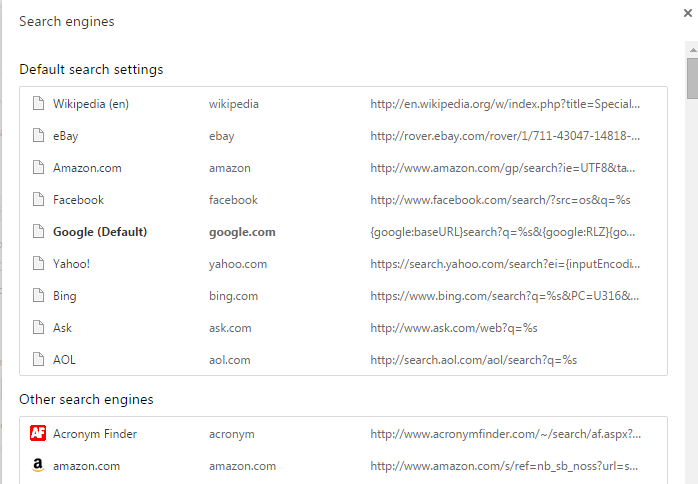 Power User Tip: you can do the same thing with the keyword “thesaurus” and your favorite thesaurus.